Say Thanks to Your Coach with an Award from the Positive Coaching Alliance! Think about the people who’ve influenced your life most. If you played sports, likely many of those people are coaches. This is your chance to thank them. 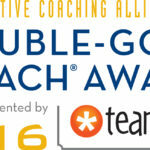 Nominate your coach for the 2018 Positive Coaching Alliance Double-Goal Coach® Award today! The Double-Goal Coach Award, now in its 17th year, is one of the highest honors a U.S. youth sports coach can receive. Positive Coaching Alliance (PCA), a national non-profit developing “Better Athletes, Better People,” works to provide all youth and high school athletes a positive, character-building youth sports experience. It’s a mission TeamSnap fully supports! The Double-Goal Coach Award honors coaches who pursue both wins and the more important goal of teaching life lessons through sports. For a sense of what a PCA Double-Goal Coach Award winner embodies, watch this video featuring Suzie Hoyt, one of last year’s recipients. The 50 national award winners will receive $200, a certificate, recognition on PCA’s website, newsletters and media campaigns and the chance to win an all expense paid trip to California to accept the honor during PCA’s National Youth Sports Awards & Benefit Sponsored by Deloitte. The events will be held on April 28 in Palo Alto, California. If you’d like to thank a special coach, nominate them today!